Since the iPad funnily enough doesn’t come with the same starter app set as the iPhone, here are some alternatives to get you started. On iPad’s big, punchy screen, Night Stand HD looks great propped up across the room as a secondary clock, or at night with the screen dimmed works perfectly as your trusty bedside alarm. With best-in-class graphic design, customizable smart alarm and waking access to your iPod music library, Night Stand HD simply blows away your current crusty relic of a clock. A great looking weather app that showcases the iPad’s screen beautifully. Weather HD, the most beautiful way to check for weather information on the iPad. See the current and forecast weather in stunning high definition videos. An RSS reader that connects to your Google Reader account and presents the information in a comprehensible manner. Well worth the price tag. For ultimate news addictiveness, also get the iPhone app and you’re good to go (note that it isn’t a universal app and will set you back another $2.99) . Update: Reeder is also under development for MacOS, at the moment you can enjoy the app in beta for free. Readability lets you read web content offline and beautifully rendered. If you come by an interesting article on the iPad, your regular web browser or in a RSS reader (like Reeder above), you can easily send the article to Readability for later reading. Syncs between the web interface, the iPad and iPhone/iPod. Retina enabled for 3rd generation iPad. If you’re not content with the text based content saving that Instapaper offers and want all the bells and whistles of a full web page, Offline Pages lets you save it all for offline browsing. Tired of seeking Wi-Fi hotspots for your iPad? Spending hours in commute train with no Internet access? This app allows you to save entire web pages, including formatting and images, and read them offline on gorgeous iPad screen. To save a page for offline reading, touch the button while surfing the web using built-in browser. Better yet, send a link from any PC, Mac, or iPhone directly to your iPad using a handy browser bookmark. While Tweetbot is neither free nor an universal app, it’s in my book worth every penny for both your iPhone and iPad. It’s featured packed and gorgeously rendered. Retina enabled for 3rd generation iPad. The official Twitter app, sufficient but no bells ‘n whistles. Not much to say, the official Facebook app lacks a lot of features you get on the web, but it’s good for general browsing. Flipboard presents various information streams (Twitter, Facebook) in a magazine like fashion. It is a really interesting way of browsing your own Twitter and Facebook accounts. Rather than focusing on what you write when you for example post a link, the information within the link gets the most attention. It does feel very compelling to use the above mentioned services within Flipboard, however; the rest of the suggested content leaves a lot to wish for. I’d be very interested to see some RSS functionality added in the future. Note that you can comment on status updates directly in the app. Flipboard is the world’s first social magazine. Your Flipboard is a fast, beautiful way to flip through news, photos and updates your friends are sharing on Facebook and Twitter. And it’s an incredible place to discover fresh content from around the Twittersphere. 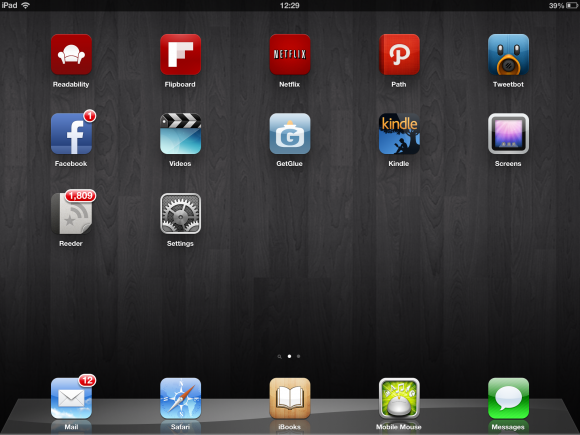 The iPad is very competent of managing all your IM needs. IM+ is free and ad-powered. IM+ Lite is the first free multiprotocol instant messaging client with iOS 4 multitasking support! IM+ will keep you connected to GTalk, Yahoo, MSN/Live Messenger, AIM/iChat, ICQ, MySpace, Jabber, Facebook chat and Twitter. New for iPad! Go Before You Go: see a street-level view of your destination, plus nearby hotels, restaurants, and more. TripAdvisor is now optimized for the iPad, iPhone and iPod touch. Plan and have the perfect trip with access to real traveler reviews, opinions, photos, maps, and forums that can answer even the most specific questions when you’re on the go. TripAdvisor is the world’s most trusted travel site with over 45 million reviews and opinions by travelers like you. The iPad is a excellent companion in your professional endeavours. It’s a perfect tool if you are visiting conventions (convert your documents, schedules and guides to PDFs), going for a meeting (convert your presentations to PDFs and use the VGA dock connector to show it on a projector or external screen) or just simply for taking meeting notes. Dropbox allows you to sync your files online and across your computers, the web interface, and iOS devices, automatically. You can get up to 2GB of online storage for free, with up to 100GB available to paying customers. All the synced files will then appear on your iPad, and many file types can be previewed right in the app, or opened from many other apps such as GoodReader. Dropbox is an excellent tool for quickly getting access to your documents on the go. The application you install on your computer will give you a “drop folder” where your documents will automatically be kept in sync. GoodReader can open and view most file formats, and is excellent for showing off PowerPoint material. GoodReader can also connect directly to Dropbox, GoogleDocs, MobileMe, box.net, FTP servers, and several other services. The app also enables direct downloads of PDFs to your iPad, which is simply achieved by putting a “g” in front of the PDFs URL in Safari (ex. ghttp://…). GoodReader can also send your documents to a number of other apps if you, for example, prefer to read your PDFs in iBooks. Within moments of downloading GoodReader, you’ll be transferring files directly from your computer over a USB cable, Wi-Fi connection, from the Internet or from email attachments. It also easily integrates with MobileMe iDisk, Google Docs, Dropbox, box.net, and other popular servers. Cheaper alternative to Apples own office suite. QuickOffice enables editing of Word and Excel documents on the go, including a somewhat unstable PowerPoint editing feature. I’ve started to do all of my reading digitally lately. I’ve found that I, just as with music, really have no need for the physical product. At home I read on my iPad (some people complain about the weight, but I’ve not found it troublesome), and then pick up on the iPhone when I leave home. It’s truly convenient when commuting. Both iBooks and Kindle syncs your reading progress over WiFi, and it’s easy to pick up where you left off. Apples own e-reader for ePUB books and PDF’s with an integrated bookstore (if you have an American iTunes account). Free classics under Project Gutenberg, are available in most international iBook stores. Retina enabled for 3rd generation iPad. Kindle allows you to read and purchase books directly from Amazon.com. Even if you have a European account, the books can still be bought and downloaded directly to your iPad and iPhone. Retina enabled for 3rd generation iPad. The Kindle app is optimized for the iPad, iPhone, and iPod touch, providing users the ability to read Kindle books using a beautiful, easy-to-use interface. You can discover and read over 630,000* books in the Kindle Store, including the latest best sellers and new releases. You can also read your Kindle books on your Kindle, Kindle DX, PC, Mac, BlackBerry, and Android-based device. Fight the evil pigs stealing the birds’ eggs. Addiction warning. The survival of the Angry Birds is at stake. Dish out revenge on the green pigs who stole the Birds’ eggs. Use the unique destructive powers of the Angry Birds to lay waste to the pigs’ fortified castles. Angry Birds features hours of gameplay, challenging physics-based castle demolition, and lots of replay value. Each of the 150 levels requires logic, skill, and brute force to crush the enemy. Most charming DotA clone I’ve ever come across. Ever wanted to be a flight controller? Well, hectic is what it is! In Flight Control HD, you’re an air traffic controller at an increasingly busy airport. Touch and drag the aircraft to their landing zones, but don’t let them collide. Sounds simple? It is, but can you juggle dozens of flights at peak hour? Mobile Mouse makes your iPad act as a giant mouse pad and keyboard for a computer on the same network. Works on Mac, PC and Linux (requires the server app to run on the computer). Ideal for remote controlling a MacMini or other HTC’s connected to a TV. Not a universal app, sadly, but also available for iPhone/iPod in Pro and free to try versions. Mobile Mouse instantly transforms your iPad into a wireless remote and trackpad for your computer! Sit back and use this remote to surf the web, browse your photo library or control your music player from the comfort of your couch. Unlike other map applications, the National Geographic World Atlas HD utilizes our highest resolution, press-ready images, providing you the same rich detail, accuracy, and artistic beauty found in our award-winning wall maps and bound atlases. The app is preloaded with 3 different styles of world maps, down to country-level detail. With an internet connection, you can continue zooming through continent-level maps to detailed Bing maps – close enough to see your home! AirDisplay extends your computer desktop to the iPad. The app basically makes the iPad act as any other display device, provided you are on the same wifi network as the computer. As the image is sent over wifi, there are some delays on the iPad’s screen, but it works excellent for things like palettes for different programs or putting your Twitter and chat windows on. You can even use touch controls on the screen in the same way you use your touchpad. You will need to download an additional app to run as host on your computer. Ever wish you had an extra display for your Mac or Windows computer? There’s an app for that! With Air Display, you can use your iPad, iPhone, or iPod touch as a wireless display, to extend your computer desktop. There are many VNC (remote desktop client) apps and many cheaper than Screens. I’ve however been hard pressed to find an app that makes sense and with multi touch support. Having a Mac Mini under the TV managing my iTunes library, I quite frequently remote in from my iPad and free apps just don’t cut it in the long run. Accessing your computer from anywhere has never been easier. Screens is the ultimate VNC client for iPad, iPhone or iPod touch!